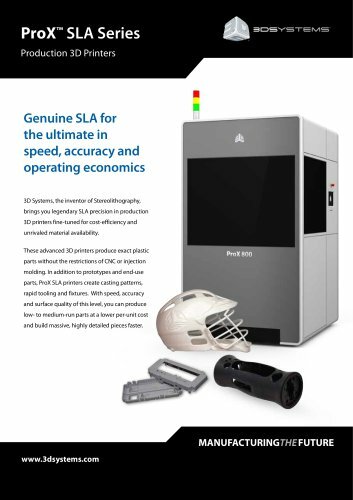 ProX™ SLA Series Production 3D Printers Genuine SLA for the ultimate in speed, accuracy and operating economics 3D Systems, the inventor of Stereolithography, brings you legendary SLA precision in production 3D printers fine-tuned for cost-efficiency and unrivaled material availability. These advanced 3D printers produce exact plastic parts without the restrictions of CNC or injection molding. In addition to prototypes and end-use parts, ProX SLA printers create casting patterns, rapid tooling and fixtures. With speed, accuracy and surface quality of this level, you can produce low- to medium-run parts at a lower per-unit cost and build massive, highly detailed pieces faster.